All transactions are safe and secure with a reliable history in online purchasing behind each of our associates. 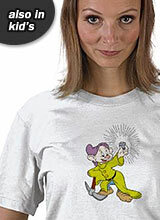 Buy the Dopey Diamond t-shirt to own Snow White clothing and merchandise. Heigh-ho, Heigh-ho, it's off to work we go! We all know the song but few people actually enjoy going to work as much as the Seven Dwarfs do. Perhaps if I was digging for diamonds and rubies on a daily basis, I would be pretty happy to go to work as well. This Dopey shirt highlights their fun filled jobs in the mine as he gazes into a gleaming diamond. If you would like to go hunting for hidden treasure yourself, scope out the rest of our Seven Dwarfs shirts and Snow White t-shirts. You are bound to find something in our gallery that makes you feel like you hit the jackpot too. In addition to the Dopey Diamond tee above, browse the Snow White Clothing Gallery for more apparel like men's and women's clothes, kids shirts or hoodies.